Story Time From Space/Science Time From Space (STFS) is a project of the Global Space Education Foundation. Our mission is to provide families, educators & students with high quality STEM and Literacy programming that utilizes the excitement of space exploration. Story Time From Space: Readings of children’s book by the Astronauts onboard the ISS to the children of Earth. These readings are recorded and hosted on the STFS website. Science Time From Space: Science experiments conducted by Astronauts onboard the ISS for educators, parents and children. Experiments have been selected to complement the concepts in the children’s books. The nine experiments cover key concepts in required science curriculum, including heat transfer, light, buoyancy, surface tension/meniscus, orbit, freefall, effect of gravity on humans, balance, and pendulums. Videos of the experiments are hosted on the STFS website. Curriculum/activities for educators and families to help support the teaching of STEM & Literacy to their students/children. Professional Development workshops that support educators in the teaching of STEM and Literacy. 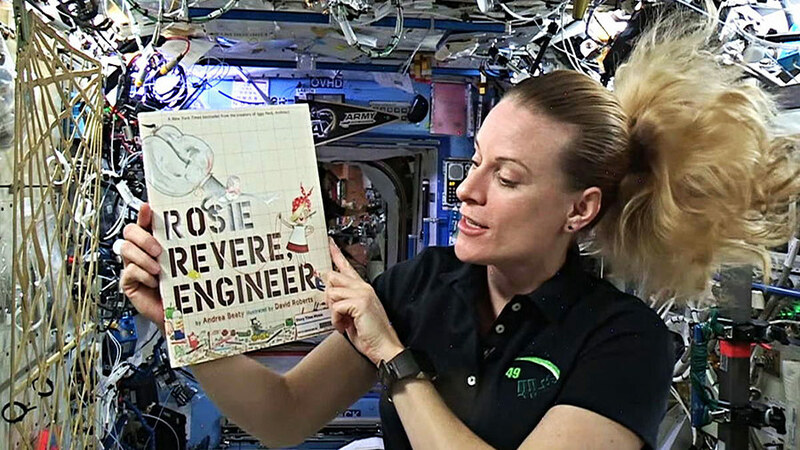 Watch astronauts on the Space Station read children’s books and perform science demonstrations! Story Time from Space offers a delightful combination of science, literacy, and entertainment through its library of family-friendly videos.